The sun is currently in Pisces (from February 19th - March 20th). If your sun sign is not Pisces, these stones are still useful. The zodiac energy of each sign surrounds all of us based on the time of the year. The energies of Pisces are at work now. Pisces energy is very interesting. It is intuitive, creative, artistic, and emotional. This energy peaks at the time of year before Spring and at the end of the astrological calendar. Pisces is about reflection at the end of a cycle. It gives you a moment to look back at previous year and see how things went, how you feel things that happened and things that didn't. Aries is right around the corner with spring into action, fiery, "let's go!" energy. Take the time and energy provided by Pisces and benefit from reflection and meditate. Additionally, this is a great time to do magical working and get in touch with strong and resourceful, elemental energy. Pisces is a sensitive sign, which needs a protection crystal. Amethyst provides spiritual protection. Generally speaking, all water energy signs can benefit from using Amethyst. Aquamarine is the perfect meditation stone for Pisces energy. It embodies watery energy and the emotional side of meditative practices. It also can protect you from your own painful emotions, which may be amplified during this time. Use Bloodstone to balance that emotional side. If you find you're becoming overwhelmed or too emotional, Bloodstone will tone it down. It is a stone that mixed emotion and grounding earth energy. Some legends say Blodstone contains the blood of Christ as it dropped to the earth; it is a combination of a very emotional time in Christianity that is grounded in the Earth. Stabilizing and calming, Blue Lace Agate is perfect for use during the time of Pisces, when emotions are high. Use it to help communicate with yourself and others as you reflect on the past year and look toward the future. Fluorite brings air energy and focus into your space. Emotions are fluid like water and sometimes require some lightness to show you what is the truth. Fluorite also can aid as your reflection leads to healing. As you reflect on the year your emotional state may leave you feeling stuck, unable to take the next steps. Jade provides stability and longevity so you can see the way forward. Labradorite is probably the best stone for water signs. During this time of high, emotional and creative energy, your aura needs protection. You will be encountering many other people and energetic interactions need protection. Labradorite is also a great stone for reflection, transformation, and intuition. Lapis Lazuli is a stone of intuition and communication. Use it at this time to harness your creative, artistic powers and communicate these to the world. Meditation with Turquoise can lead to healing and release from the past year as you move into the spring season. Your emotions may keep you from gaining value from reflection. Ruby in Kyanite is nurturing and balancing; t is good for dealing with feelings of overwhelm. Iolite keeps your Third Eye open, and welcoming to intuitive flashes during this intuitive time. Even if you aren't prone to heightened intuition, listen to them when they hit you. Black Tourmaline can be used to protect you from the emotional energy of this time. It is also a gentle grounding stone when you may be feeling spacey or in your head. 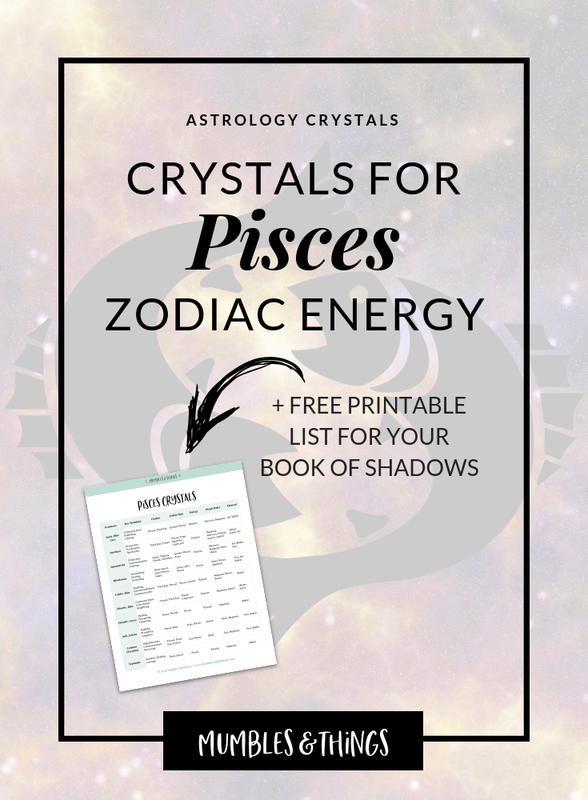 Want my list of Pisces crystals? Click the button below to request your list to be sent to your inbox. This list includes the top 10 crystals associated with the zodiac sign Pisces, plus, the three key uses, primary chakras, polar energy, planetary ruler and element correspondence. Continue your journey and share you experiences on the Mumbles and Things Facebook page or comment below. Understanding Astrology: What is a Rising Sign? Understanding Astrology: What is a Moon sign? Understanding Astrology: What is a Sun Sign? Are there other crystals you would add to this list? Tell me about them in a comment below.